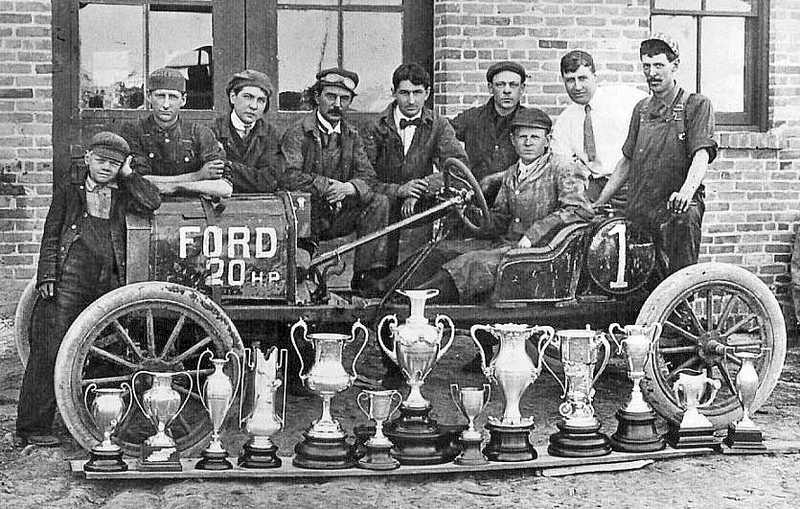 Today’s feature contains photos of seven Ford racing cars and road driven speedsters. It has been said that the Model “T” Ford put the Country on wheels, in addition, it was constructed on a lightweight chassis that was easy to modify into inexpensive racing car or speedster; for the most part it was the first American hot rod. After WWI the movement provided any number of young daring and restless ex-servicemen a vehicle and speed equipment to modify in any way they saw fit. 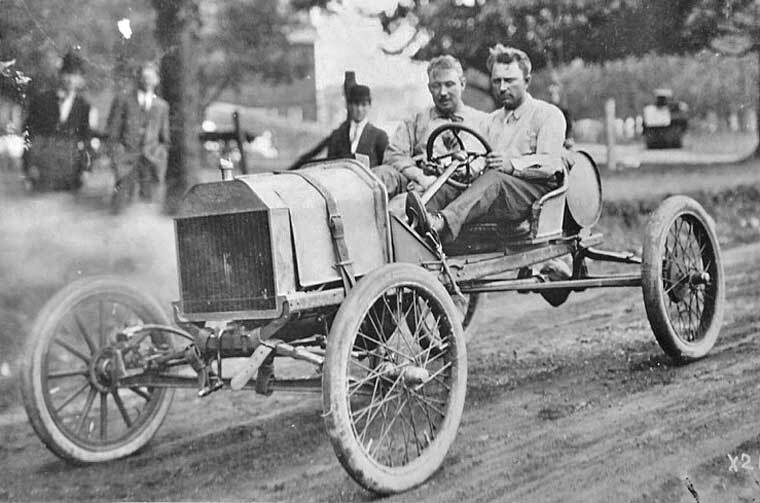 Earlier we posted a five-part series called Model T Ford Speed and Racing Equipment where you can learn more about the subject and view some very interesting speed equipment and a number of early Ford racing cars. 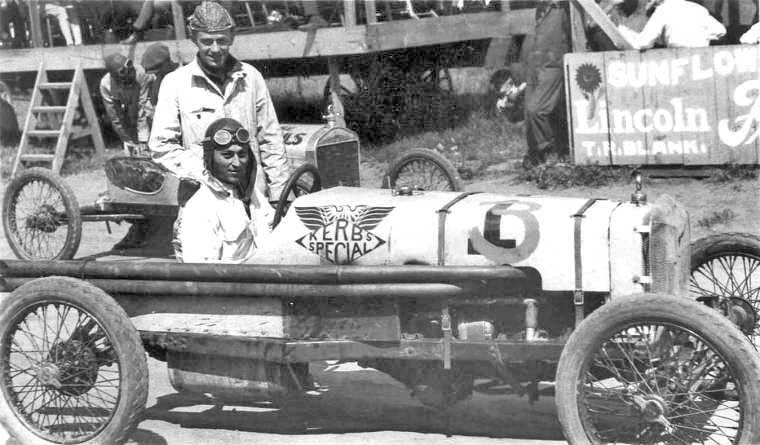 The lead image shows Leonard E. Kerbs “The Kansas Cyclone,” a very successful mid-western racer with his crew and friends posing in front of “Kerbs Garage,” which was run by his father. 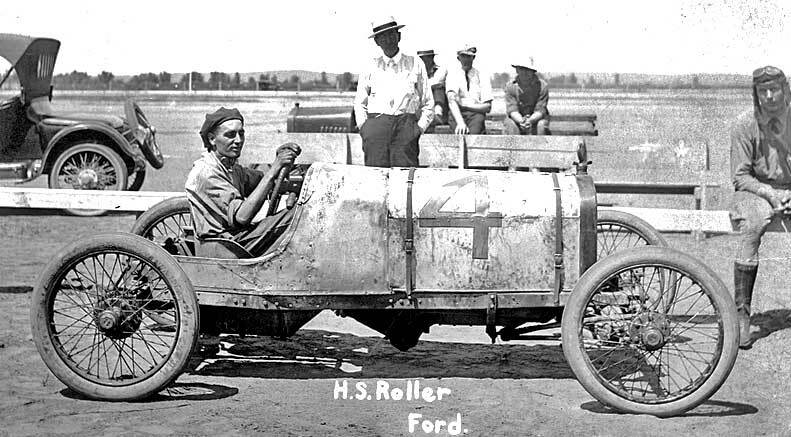 This stripped down brass racing car is first in a series of Ford’s he drove during his long racing career. The trophies displayed in front of it attest to his abilities behind the wheel and the fast lap times this vehicle was capable of setting. Three of the Ford owners (below) are identified. Share with us what you find of interest in the photos found via The Model “T” Club International. Leonard E. Kerbs the Kansas State Champion and his “Number 1” pictured in the 1920s. It was a bobbed Ford equipped with a Frontenac cylinder head and other speed equipment. The car was re-numbered for a race outside of Kansas. H.S. Roller in a bobbed 1920s Ford racing car. 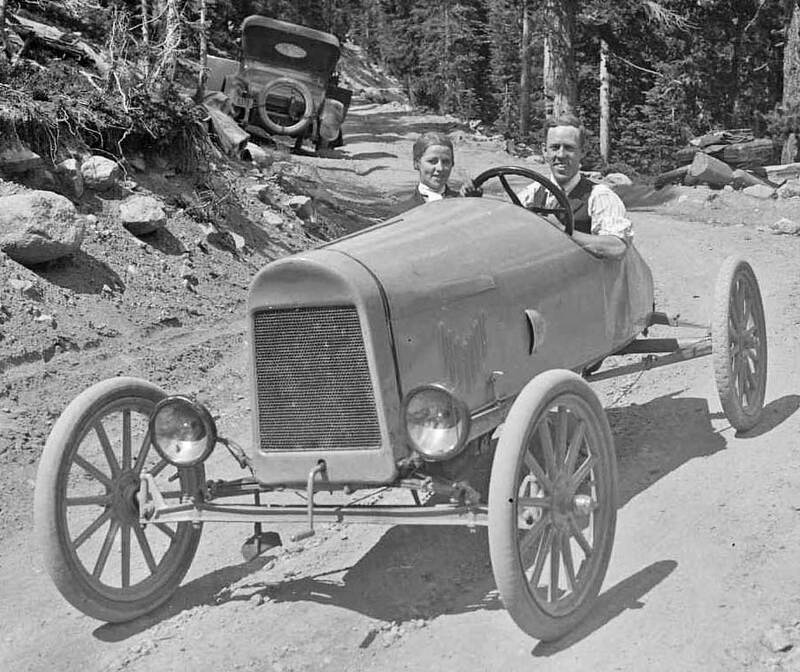 Howard J. Frank behind the wheel of an early brass Ford speedster with W.S. Harrison to his right. 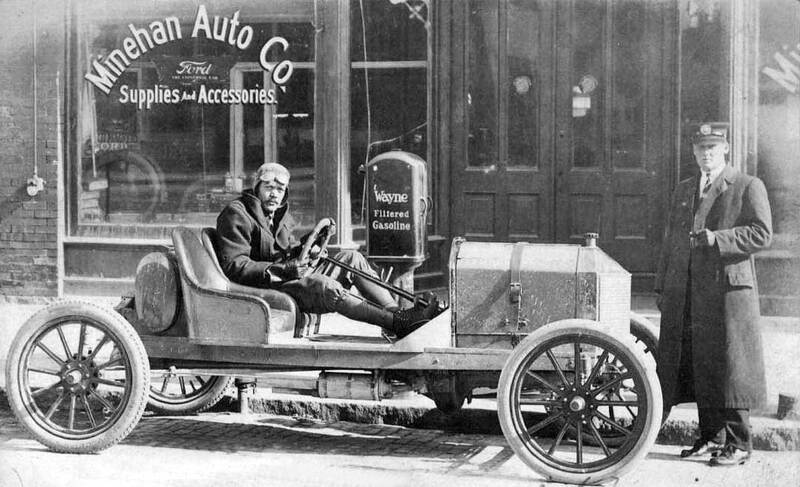 The Minehan Auto Co. was located in Brunswick, Georgia. This entry was posted in Auto photos 1885 - 1920, Auto photos 1921 - 1942, Auto Racing 1894 - 1942 and tagged Model T Ford, Model T Ford Speedsters and Racing Cars. Another great series of pictures. We really appreciate the effort you make to provide us with all the great photos. In the fifth picture, note the leather belting used to snub the front axle. Looks like an early attempt at shocks. The belts only control how far the springs rebound. My grandfather (Vern Peatling) had the cousin of Lenorard Kirds rebuild the “number 1” car. It’s currently in the Belleview High Banks Museum in Belleview Kansas. The last time it was driven at race speed was 1969. The museum website has more information on the car, as well as the build. David, that is true but it will slow down some of the bounce. I wonder when the first friction shocks were used? 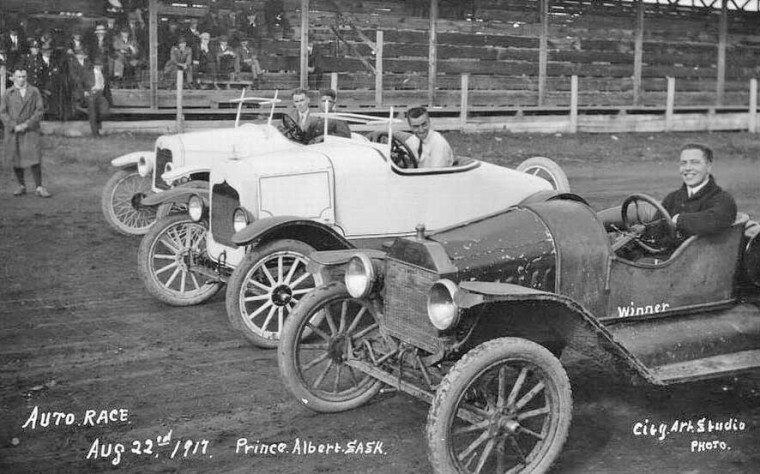 Such a wonderful group of model T speedster/racers in their hey-day! Most of these, I have seen before. The sixth one is so interesting. The “winner” is written on the picture. He probably won because the other two cars were simply too pretty to be pushed hard on the dirt oval. Forty-five years ago, I was fortunate to be part of a model T Ford “dirt track racing reenactment” event that was held for four years before insurance and liability issues put an end to the event. It was pretty much the most fun I ever had in my life! My speedster was the slowest car there (hey, I was just a kid then! ), but it looked the part. Every year, I would spend about two weeks after the meet re-settling the springs, touching up the paint, making the car look a little nicer again. Next year, do it all over again! About half the cars there ran on wooden spoke wheels. To this day, I like and trust my wood wheels. We were running on an over half mile dirt oval used by modern sprint cars much of the year. My car was clocked at over 45 mph a few times. The fastest Ts? A couple Rajos and a Fronty were clocked at over 60 mph! The fastest T racing car at those meets took a mere five seconds longer than the record holding modern sprint car did for the over half mile! Also notice in the sixth picture, the “winner” car has H&D type “shock absorbers”, a simple spring type bump softener. Friction type shock absorbers go way back to about 1900 in Europe. The leather rebound straps shown so well in picture five put a jolting stop to the spring’s natural rebound. Although not a true shock absorber, they do help with handling quite a lot. The fastest of the five model T racing cars I restored over the years had such straps on it. I liked the way it handled! Picture number seven has been discussed extensively on speedster forums. Although there really isn’t a lot in the way of accessories to comment about, the clean lines of the car give it an impressive appearance. It is often called a favorite by people into such things. Pictures one, four, and five, I think are my favorites. However, I do lean towards the brass era cars in general. Number one has also been discussed often on speedster forums. I like its full length and slight lowering, mostly in the rear. I sure would like to get an up-close look at that steering column! It must have been lengthened. I can only wonder how it was done. Most local shops that early did not have good welding facilities. I would hate to think of the steering shaft being forge welded for racing use. Although a really good blacksmith should be able to do the job as well as any other technology commonly available at that time. The column tube may have been simply parts of two columns riveted together to get the length. Picture number three is really neat also! I bet that car handles really great on short ovals! The roadster in the background appears to be an about 1920 Dodge Brothers with the wire wheel option. A nice car, but not as fast as that Ford would be! Picture number four. I feel like I am looking in a mirror! That is almost exactly how I used to look often when driving my speedsters or racing Ts. I still have the leather leggings, flyer’s cap, breaches, and coat similar to that one. All fantastic pictures capturing a special time in automotive history! Thank you David G ! The car in #7 looks like it may have a laurel speedster body? In the lead photo, that steering column is very long and it doesn’t look like his feet will reach the pedals. And the trophies looked better back then,too. Gorgeous silver trophies. Most of that era were sterling silver, not electroplate, and were actually re-purposed as trophies from their original use as serving pieces or vases, because they provided large areas for engraving. They were literally “worth their weight in silver”. Today, they are highly collectible and restaurants love them to add a sporting atmosphere to their decor. The ewer or pitcher seemed to be the preferred shape, but I’d take that loving cup/champagne bucket in a heartbeat (5th from left). It touches my antique collector heart. Evidently in photo #5 the only way to have a speedometer is to have a wood wheel on the passenger side since the gear is screwed on three spokes. The last car photo shows a lack of a radiator cap. Is this the genesis of Formula Ford? Thanks for another enjoyable Saturday! No, quite the opposite – a poor mans racing car.